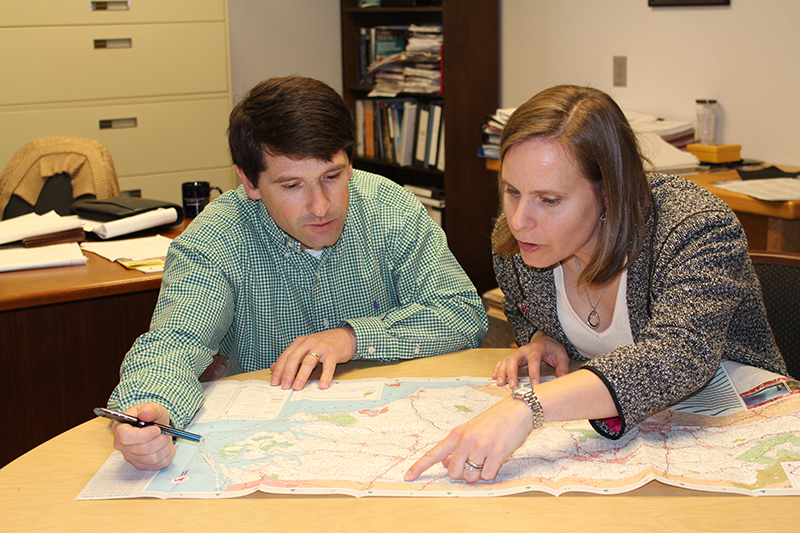 The American Society of Adaptation Professionals has recognized John Fear, deputy director of North Carolina Sea Grant and the state’s Water Resources Research Institute, and Holly White, principal planner for the Town of Nags Head. Both received honors at the Carolinas Regional Adaptation Leadership Awards ceremony at the Carolinas Climate Resilience Conference in October. The awards celebrate the exceptional work of people who have spearheaded climate change adaptation, and nominees included distinguished leaders from all sectors. White won the top regional honor. Fear received an honorable mention for building capacity and fostering connectivity. “With John’s thoughtful input, climate change topics — and related adaptation responses at a variety of levels – are integrated not only into strategic plans but truly into daily operations,” says Susan White, executive director for the state’s Sea Grant and WRRI programs. Fear’s foresight matches an ability to set up projects for real-world success, she adds. The society honored Holly White, a longtime partner of North Carolina Sea Grant, in large part for driving the Town of Nags Head’s planning for sea level rise and helping to nest that process within a broader planning effort for the town. 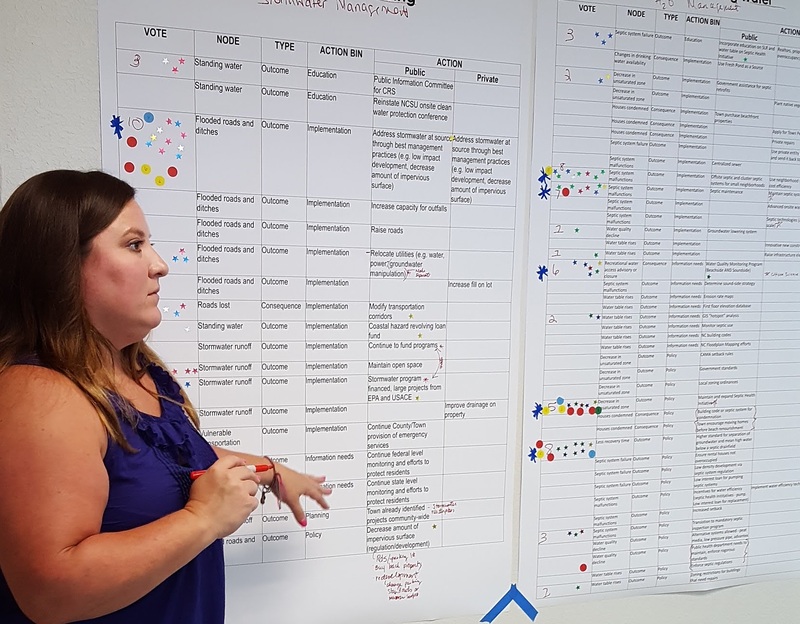 For the past four years she has served as the town’s principal planner, following positions with Currituck County and the Town of Kitty Hawk. The selection committee additionally noted Fear’s successes, particularly in identifying and addressing big picture challenges, along with his ability to train the future workforce. The committee called special attention to his emphasis on helping students conduct more outreach and real-time communication. Fear chairs the North Carolina Sentinel Site Cooperative, which addresses climate change impacts along our state’s coast. A program of the National Oceanic and Atmospheric Administration, the cooperative promotes a network of organizational partners from scientific and academic communities, resource managers, and nongovernmental organizations. Its research and monitoring programs enhance understanding of the coastal environment, including sea level rise, marsh ecosystems and living shorelines. He also oversees the research portfolio for the state’s Sea Grant and WRRI programs. As such, he serves as a primary strategist for the Community Collaborative Research Grant Program, which funded the innovative RISING project, among many other successful initiatives that have addressed climate change impacts directly and indirectly. The RISING project generated community- level discussions of sea level rise, providing forums for meaningful public dialogue, in some places for the first time. The society’s third regional honoree this year was Steven Frank, associate professor of entomology at North Carolina State University. He received an honorable mention for adaptation integration. His core interests include the exploration of urban warming and its relationship to global warming and climate change.